Karl Amadeus Hartmann (1905-1963) is one of the most significant but least-known symphonic composers of the 20th century. This set of three hybrid SACDs, issued to mark the 50th anniversary of the German composer's death, features his eight symphonies played by the Netherlands Radio Philharmonic and Chamber Philharmonic Orchestras under the batons of several major conductors, including Christoph Poppen, Osmo Vanska, James Gaffigan and Markus Stenz. Two types of movement, adagio and scherzo, form the unmistakable axis of Hartmann's symphonic works, and the result is that the musical discourse continually takes place between expansion and energy, monumental stasis and a dynamic primal force toppling everything in its path. Hartmann's symphonic legacy most certainly deserves its rightful place in the canon, especially in English-speaking countries where it's been often overlooked. "Under the grasping and cautious direction of Markus Stenz, the Netherlands Radio Philharmonic makes music audible that artistically shimmers between neoclassicism and moderne, jazz and dadaism." "Six directors which perform brilliant with two dutch orchestras." "Critics poll 2014 - One of the best ten recordings of the year for Stephan Schwarz"
""We can say without exeption that this is an top prestation""
"This set is a formidable achievement, superbly recorded. Play these discs at high volume when your neighbours are out." "In view of Interpretation and Sound, this is an inspirational recording, which can be named as a new reference. "The duties here fall to James Gaffigan, who claws open the symphony with a confidence not quite heard elsewhere." "(...) this Challenge Classic release still warrants the firmest of recommendations"
"If you're equipped for surround sound, this is the set to go for." 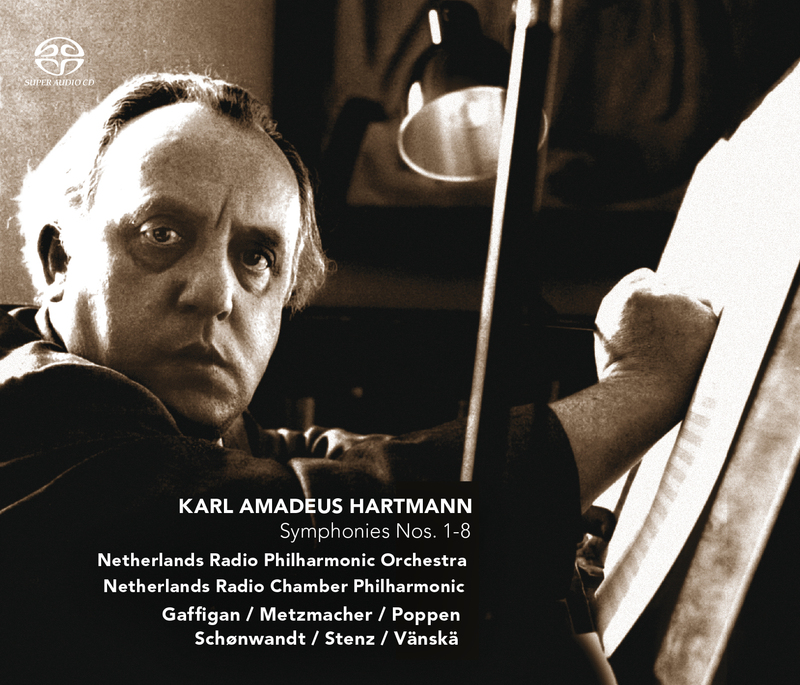 "Karl Amadeus Hartmann (1905-1963) is one of the most significant but least-known symphonic composers of the 20th century. This set of three hybrid SACDs, issued to mark the 50th anniversary of the German composer’s death, features his eight symphonies played by the Netherlands Radio Philharmonic and Chamber Philharmonic Orchestras under the expert batons of several major conductors. An truly enriching production!" "This CD release is a document which value can not be estimated enough: top performances from a vital link in a great tradition"
"We can say that this is a top performance, without any exception"
"The collection of symphonies is a valuable document"